Give your dog the gift of exercise and socialization at Doggy Dates dog day care. Wayland locals trust us with playdates, overnight care, and more. Since 2011, locals have trusted our team of playdate supervisors to give dogs exactly what they need – exercise and socialization. Whether you’re going through a particularly hard time at work or you need someone you can trust to fill in the gaps on a regular basis, our team is here to help. You haven’t seen a dog day care in Wayland quite like this before. At Doggy Dates, we believe that dogs are family, and that’s how we treat yours. All our staff members are dog enthusiasts with longtime personal and professional experience. We love introducing new dogs into our dog day care in Wayland and seeing what each new personality brings. Some of our regulars are older pups who prefer to lounge with the humans while the young ones get a thrill from romping on our acre of fenced-in countryside. We take dogs of all ages and most breeds, enabling us to create a strong pack for socialization skills and energy burning. At our dog day care in Wayland, dogs can be dogs. If you’re interested in seeing more about the types of dogs we entertain at our dog day care in Wayland, check out our Facebook page. Every day we post pictures and footage of your fur babies frolicking and having fun on an entire acre of fenced-in property. They have the opportunity to live out their dreams as farm dogs and come home to you tired and happy. If you’re searching for dog day care in Wayland, your dog just might prefer the flexibility and open environment at Doggy Dates. 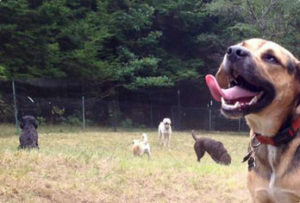 Programs for dog day care in Wayland vary. Some individual dog sitters may provide walking and feeding services only. Others provide more-comprehensive services, but keep the dogs in a very restricted environment. At Doggy Dates, we control the environment and the kinds of dogs we allow into our playdate sessions, but we generally allow dogs to be themselves. Some love rolling in the hay while others feel their best running laps around their more subdued playmates. You can count on our dog day care in Wayland to deliver a holistic and inclusive experience. Our team consists of professionals and enthusiasts who are passionate about caring for dogs. Many of us grew up with dogs, volunteered in shelters, and dedicated our educational careers to learning more about dogs. In other words, you won’t find a more dedicated crew to handle transportation, playdate supervision, and overnight stays. Our dog day care in Wayland offers freedom, flexibility, and fun for our clients and our dogs. For all our potential clients, we offer a free trial period as part of our dog day care in Wayland. Let your dog interact with some of our regulars and experience the culture for yourself. After one session, we feel confident you’ll enroll your pet in as-needed or regular playdate sessions. Sign up for a free trial today. From start to finish, we treat each of our guests as we would our own pets. We regularly provide special perks on social media as part of our dog day care in Wayland. Social media helps us share our dogs’ experiences with their owners and other community members. We regularly post photos and videos so you can stay in touch with your dog’s activities throughout the day. On special occasions, we also run deals and specials. For example, this Halloween season, we conducted a costume contest! The pet photos with the most Facebook and Instagram likes won a free playdate. Why Enroll in Dog Day Care Wayland? Dogs need exercise. Let’s face it; American jobs are more time consuming and stressful than ever before. If you’re stuck at the office, you can’t go on a jog with your furry family member or play tug-of-war in the living room. We know you want to be home playing with your pet, but we offer the next-best solution. We’ll take your dog to a large fenced-in area for a few hours to take some of the stress of the day off your plate. Our clients know they can trust us. Not all programs for dog day care in Wayland are created equal. Some provide basic care while others charge a fortune. At Doggie Dates, our clients know they can rely on our team members to provide premier and personalized care services at competitive rates. Dogs are social creatures. Many of our clients own one dog. Dogs, especially young ones, need socialization to learn appropriate behaviors and build social skills. Our dog day care in Wayland encourages socialization between breeds and sizes. We do our best to accommodate dogs with special needs, so everyone benefits from their time at our fenced-in enclosure. Our dog day care in Wayland can break your dog out of its shell, calm a nervous breed, and lead to a more successful at-home experience. For these reasons, we hope you’ll consider Doggy Dates as the place where a dog can be a dog. Doggy Dates provides several layers of services to make our clients’ lives easier. We put your pet’s health and wellbeing first, and that’s why more locals searching for dog day care in Wayland trust Doggy Dates. In addition to group playdates, we encourage our clients to take advantage of our training and overnight services, too. Our resident trainer specializes in some of the most challenging behaviors to break, including jumping, barking, and refusing to come when you call. If you invest in our overnight services, your dog will stay in a loving home instead of in a cold kennel environment. For more information about our dog day care, Wayland residents can reach us at (781) 801-2526.